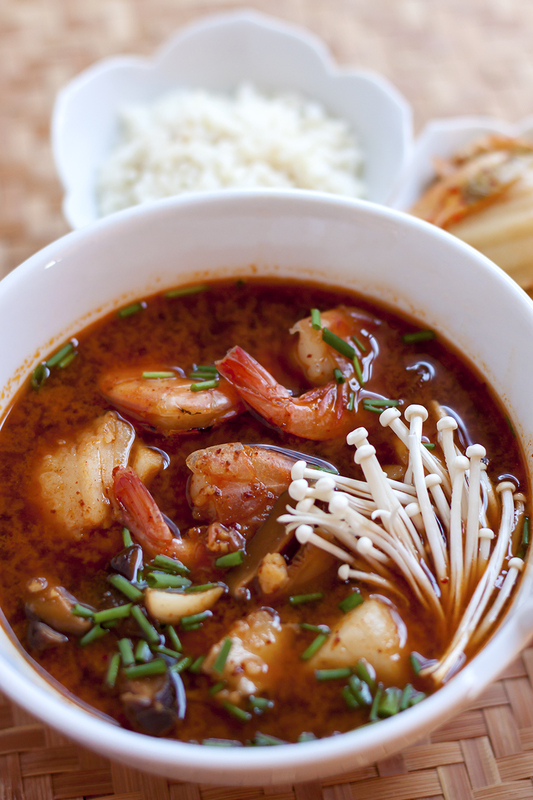 Think of this savory stew as a sort of spicy Korean bouillabaisse. 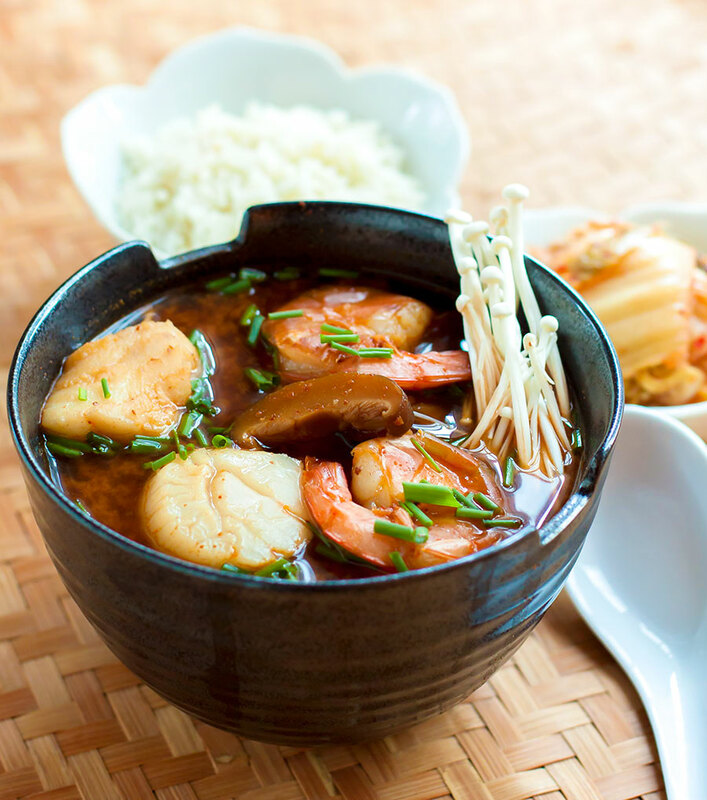 It’s based on the kind of traditional, home-style soup that’s a staple in Korean households. We’ve perhaps taken a few liberties with the ingredients, but we’d like to think that our version is still true to the spirit of the original recipe. This is the kind of warming soup that’s just the ticket for a cold, raw & rainy afternoon. It’s also a soup that’s perfect for cleaning out the fridge. If your pantry is well-stocked with basic Asian ingredients like gochujang (fermented pepper paste), ground chili pepper, dried mushrooms and fish sauce, you’re already halfway there. Add whatever odds and ends you have on hand and you’ve got a hearty, head-clearing, rib-sticking meal in a single bowl. We’ve made our version with seafood, but there’s no end to the possible variations on this theme. Add pork or chicken for a meatier style soup or stick to vegetables and tofu for a vegetarian version. It’s a soup that everyone can enjoy, no matter what your preference – as long as you like it spicy and full of flavor. 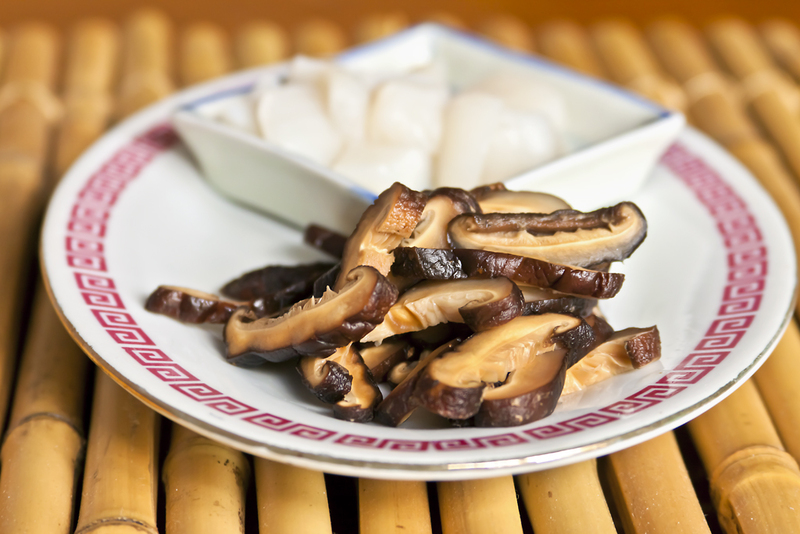 Reconstitute the dried shiitake in 1 cup of hot water for about 35 minutes. Strain, reserving the water. Squeeze dry and and snip off the stems with a pair of kitchen shears. Discard the stems and slice the mushroom caps into strips. Set aside. Combine the minced garlic and sesame oil in small bowl. Heat the vegetable oil in a large pot over medium heat. Add the sliced shiitake mushrooms and saute for a few minutes, then remove to bowl. Add the vegetables, green onion pieces, and mixture of garlic and sesame oil to pot and stir until fragrant, 30 seconds. Sprinkle in the ground pepper (gochugaru) and stir for another minute, being careful not to let it scorch. Pour in the stock and 1 cup of reserved mushroom reconstitution liquid. Bring to a boil, then reduce the heat and simmer for about 10 minutes, or until the vegetables are tender. Stir in the pepper paste (gochujang) until dissolved, then add the seafood, including shrimp. Reduce the heat to very low and simmer just until the shrimp turns opaque. Remove from the heat immediately and sir in the fish sauce and soy sauce. Ladle into bowls. Garnish each serving with sliced green onion, a few drops of sesame oil and a small bundle of enoki mushrooms, if using. Serve with steamed rice and kimchi on the side.